At the Delaware River Club, we still feel using the Latin / scientific names helps people become better fly fishers, especially when faced with general terms such as “blue winged olive.” On many rivers this may be enough to identify an insect, but on the Delaware we can have 5 different species of blue winged olives (BWOs) hatching simultaneously, and both their appearance and behavior can vary dramatically. Are they Light winged? Dark winged? What color olive is the body? What are its emergence habits?Knowing the specific species (through the Latin) becomes invaluable. But who names these critters? The scientists who study them, and they can be a finicky bunch. These professional entomologists continue to refine the classification (scientific naming) of mayflies, and it is an ongoing process that likely will never end. 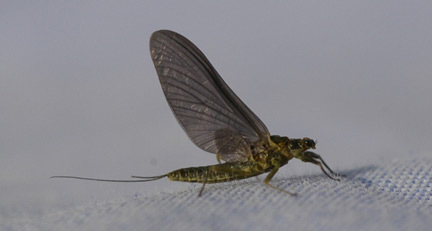 To simplify this, we have decided to continue to use the mayfly classifications most familiar to fly fishermen (and us!) on our river updates, fly selection, and in general bug-nerd conversations. The chart below is for reference purposes for those who are curious about the name changes. Don’t get too attached – you never know when they may change it again!